The good news: It's a a great idea. It's fun and it's tasty. The bad news: 30% of of your daily recommended saturated fat and 17 grams of sugar per serving. The variety I tried was Mixed Berry Granola. I used the microwave cooking method. The actually cooked product isn't nearly as pretty as the pizza on the box, but in comparison to some other microwave products, it still looks fairly appetizing. You may have to move a few berries around to make sure you get one in every bite. The amount of berries might seem small, but the taste of berries is BIG. Raspberry is the most prevalent flavor and you get a burst of real berry flavor in every bite, even in those rare bites that have no physical berries. The crust is softer than you might expect which actually works well with the toppings. It's a sweet crust and, despite wheat flour being the first ingredient, it doesn't taste like a wheat crust. The granola splattered across the top of the pizza acts more like a texture filler than a noticeable ingredient. It would have been nice if the granola had crisped and stood out a little more. 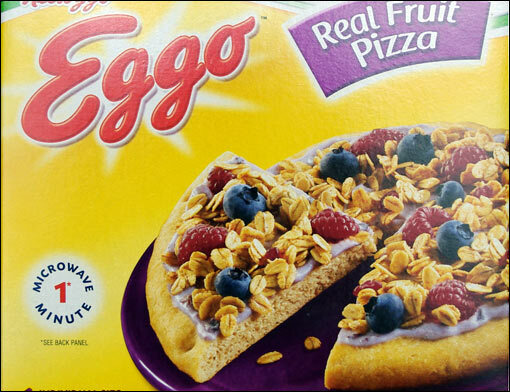 This Eggo Real Fruit pizza reminded me of a cobbler or berry crisp. There's a home cooked dessert feeling to it to. If nothing else, it will remind you how wonderful warm berries can be. If you think you might like this product, you probably will. Give this one a try as a special treat. Nutritional considerations: Each 1 pizza serving has 390 calories, 13 grams of fat (6 grams saturated fat; 0 grams trans fat), 62 grams total carbs, 4 grams dietary fiber, 17 grams sugars and 10 grams protein. 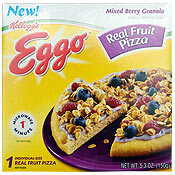 What do you think of Eggo Real Fruit Pizza? The topping looks like throw up. So, so, so, so, so, so good!!! This is so, so, so, so good!!! I LOVE IT!!! Ha Ha oh holy cow. 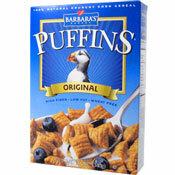 I just realized that they don't make breakfast products for kids anymore. It's all stoner food, man. I'm going to say it's terrific and even go so far as to write a letter to the marketing team that made this and dare them to make an even crazier Eggo product. They have six months. Seems like a strange product. The dough looks so much thicker on the packaging than in those screenshots. Oh my gawd... that looks terrible, hope you are OK from eating that. I don't think it would really click, pizza with cheese and tomato just is the best. I don't think fruit pizza is really working to me, but I spose I'm not liking it so much because I haven't tried it yet.